Section 80D of the Income Tax Act, 1961, allows you to avail tax deduction on medical insurance. Through Section 80D, you can avail tax benefit on the premiums paid for medical insurance for self, spouse, parents, and dependent children as well. Medical insurance policies come with a bundle of benefits and looking at the current situation of lifestyle, health issues and the environment, a medical insurance policy has become a necessity for everyone. It not only protects you from hospital expenses, but also allows you to tackle the rising cost of healthcare in the best way possible. Cashless treatment, free health checkups, best medical facility, etc. are some of the benefits offered under a medical insurance policy. Other than the above mentioned benefits, a medical insurance policy also provides a tax benefit under Section 80D of the Income Tax Act. So let us understand the various aspects of tax deductions claimed under Section 80D of the prevailing Income Tax Law. Section 80D of the Income Tax Act, 1961, allows you to avail the tax deduction on medical insurance. Through Section 80D, you can avail tax benefit on the premiums paid for medical insurance for self, spouse, parents, and dependent children as well. The maximum limit for tax deduction under Section 80D varies according to the age and relation of the person insured. For example, the tax deduction limit for a spouse is different from parents who fall under the senior citizen category. Mediclaim premium paid by any instrument other than cash is eligible for tax deductions under this section. So let’s understand the various scenarios of tax deductions with examples to understand this section in detail. If you are paying premium for a medical insurance policy for self, your spouse and/or dependant children who are insured under the health insurance policy, then the premium paid is tax deductible under Section 80D. The maximum limit of the tax deduction in such a case is Rs.25,000 per year, which has been raised from the earlier limit of Rs.15,000 in the budget for the year 2015-2016. In case if the insured person falls under the category of a senior citizen, then the maximum limit for tax deduction is Rs.30,000, which has been raised from the earlier limit of Rs.20,000 in the budget for the year 2015-2016. Family members covered in the policy- Mr. Kumar, his spouse (age: 32 years) and his two dependant kids. Mr. Kumar is paying a health insurance premium of Rs.31,000 annually. Under this scenario he is eligible for a maximum tax deduction limit of Rs.25,000 under Section 80 D out of Rs.31,000 paid as mediclaim insurance premium. Mr.Kumar (62 years old) has a medical insurance policy which covers him and his spouse. The yearly premium paid for the policy is Rs.32,000. So, Mr. Kumar is eligible for a tax deduction ofup to Rs 30,000 out of Rs 32,000, as the maximum limit for tax deduction under Section 80 D of tax laws is Rs 30,000 for person who falls in the category of senior citizen. If you are paying premium for the medical insurance policy of your parents, then the maximum limit for tax deduction is Rs.25,000 per year. And if your parents fall under the category of senior citizen, then the maximum limit for tax deduction is Rs.30,000 per year. Even If any of the parent is a senior citizen, then also an individual paying mediclaim insurance premium is allowed a tax deduction up to Rs 30,000. Mr.Kumar is paying the premium of Rs 30,000 towards his parents Health Insurance Policy. Under this example, Mr.Kumar is eligible for a maximum tax deduction limit of Rs.25,000 under Section 80 D of IT Act,1961. Mr.Kumar is paying the premium of Rs 35,000 towards his parents Health Insurance Policy. Under this example,Mr.Kumar is eligible for a maximum tax deduction limit of Rs.30,000 under Section 80D of IT Act,1961. You also get a tax deduction up to the extent of Rs.5,000 for health checkup which can be claimed every year. 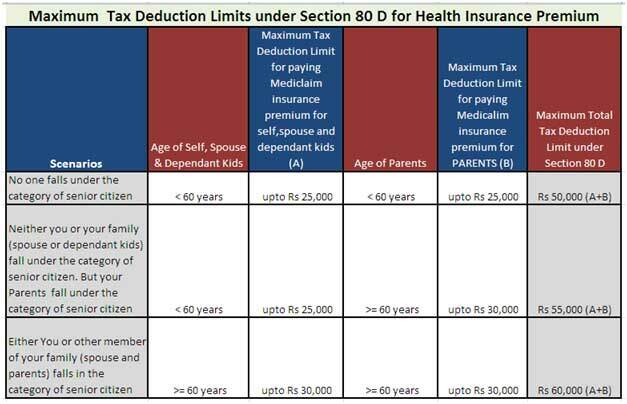 The health checkup limit includes you and your family members (dependent kids, spouse, and parents).The tax deduction limit of Rs 5,000 is not over and above the tax limits explained earlier rather it can be claimed inclusive of the individual tax deduction limits under Section 80 D of the Income Tax Act. Mr. Kumar, who is 42 years of page made the following payments during the year 2015-16. Mediclaim insurance premium for Rs 12,000 for self. Mediclaim insurance premium paid for spouse and a dependent child for Rs 10,000. Mediclaim insurance premium paid for his self employed daughter for Rs 6,000. Payment of Rs 4,000 towards detailed health check up for his own self. Mediclaim insurance premium paid for his brother for Rs 4,000. Mediclaim insurance premium paid for parents (aged above 60 years) for Rs 32,000. Let us calculate the total rebate, which Mr.Kumar can claim under Section 80D. Maximum Limit of Tax deduction for Mr. Kumar under Section 80D = Rs 25,000. Mediclaim insurance premium paid for self -Rs 12,000. Mediclaim insurance premium paid for spouse and dependent child – Rs 10,000. Total = Rs 22,000 eligible for tax deduction. Out of Rs 4,000 spent on health check up for self, Rs 3,000 can only qualify for tax deduction as Mr.Kumar has already reached Rs 22,000 for claiming tax rebate under Section 80 D.
Total Tax deduction which can be claimed by Mr Kumar is Rs 55,000 (Rs 25,000 – Figure A + Rs 30,000- Figure B) under Section 80 D.
Mediclaim insurance premium (Rs 6,000) paid for self employed daughter as she is an independent child. Mediclaim insurance premium (Rs 4,000) paid for his brother as mediclaim premium paid for specified relations are only eligible for tax deductions. Along with the various major benefits of Health Insurance Policy, you can take advantage of your medical insurance policy for saving the tax under Section 80D of Income Tax Act. 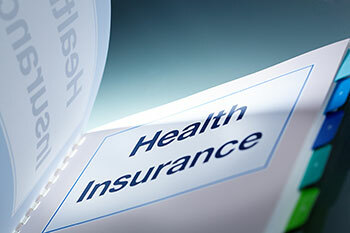 But while buying a health insurance policy, tax benefit should be just one of the objectives of buying a policy rather being the sole objective.